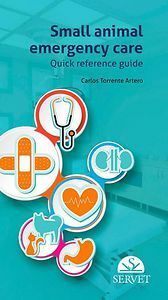 This handbook about small animal emergency care contains the diagnostic and therapeutic approaches to the most common emergencies seen in small animal practice, classified by organ systems. For each emergency, a definition of the condition that has caused the situation, its causes, the diagnostic approach, and the most appropriate treatment are provided. The goal is to provide an easily accessible quick reference guide to save valuable time during stressful emergency medical cases.